Boxwoods are iconic shrubs, but they’re not perfectly suited for all climates. The elegance and formality that boxwood hedges lend to a landscape is unmatched by other shrubs, but in many locations they suffer badly in the winter time. 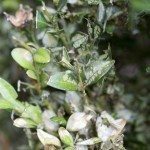 Protecting boxwood in winter is no small task, but boxwood winter damage is no small thing for your shrub. Just like you care for your boxwoods in summer, care of boxwoods in winter is paramount. Luckily, we’re here to help. Boxwoods suffer badly in winter because they’re native to areas where winters are very mild. This means that having them in your landscape may require a great deal more effort to keep them looking good. Winter burn is a common problem of boxwoods. It may cause you some pretty serious concern the first time you see it, but a little bit isn’t usually a major problem. The primary symptom of winter burn is a discoloration of exposed areas of the plant, especially on the south side. Leaves may bleach to a tannish color, or they may necrotize and turn brown to black. Either way, those particular leaves are goners, but unless the burn is extensive or your bush is very young, it’ll survive to see another winter. It’s when this happens year after year that your bush may start to suffer long-term damage. There’s no good way to approach treating cold injury in boxwoods, but most people start by pruning their shrubs back as soon as the damage is noticed. Wait until early spring to do any major trimming, though, because too much pruning can encourage the production of tender shoots that can’t take the winter any better than those sections you just removed. Prevention and protection are the key words if your boxwood suffers winter damage year after year. Winter damage typically occurs when the ground’s frozen and cold, dry winds blow across exposed leaf surfaces. This particular combination encourages the leaves to transpire fluids to the environment when the plant is unable to draw more fluid in to replace what was lost. This situation leads to rapid leaf collapse, though in the winter, it may be hard to tell right away. It’s not unusual for damage to appear in the spring, after everything has thawed. Some people wrap their boxwoods with burlap in anticipation of major storms, but frankly, this is generally a pointless practice when it comes to winter damage. It may protect the bush from heavy snows that cause breakage, but keeping the boxwood hydrated is the only thing that will save it from the dehydration that causes winter damage. This year, instead of wrapping and wondering why your shrub is still hurting, try applying a thick layer of mulch to its root system to help the soil hold onto both moisture and heat. Remember to water your bush during the winter, too, especially if you live in a windy area. If boxwoods prove too much work to maintain in your climate, give a holly a try – many are extremely cold hardy and small-leafed varieties can be clipped into formal hedges.